In the revolutionary cause of President Ho Chi Minh, a pre-eminent Leader of the Vietnamese nation, a National Liberation Hero, a Great Man of Culture, he gave our nation, people and human race a valuable legacy of theories, including his military thought. Ho Chi Minh’s thought on building all-people national defence and people’s war represents an integral component of his military thought and a uniform direction for the national liberation cause as well as Homeland construction and protection. This serves as the theoretical background for our Party to lay down strategic measures for the cause of strengthening defence and safeguarding the Homeland in the new period. Regarding the building of all-people national defence, Ho Chi Minh advocates attaching great importance to building the all-people national defence and tapping the all people’s strength to build it. This is a uniform, important, scientific, revolutionary theoretical point in his thought on building the all-people national defence. Right after the advent of the revolutionary government, President Ho Chi Minh pointed out that “our country has just regained independence and shall undergo tough steps to strengthen it. Therefore, all our people, young or old, shall shoulder this burden”. Ho Chi Minh believes that only by relying on and bringing into the all people’s strength could we build strong all-people national defence in terms defence potential, force and posture. Moreover, that shall be the increasingly modern national defence of independence, self-reliance and self-resilience closely combined with security, diplomacy, economy, culture and society, which is both goal and guideline set by Ho Chi Minh and our Party for building the national defence. Building the national defence serves as the noble cause of the whole Party and people with the armed forces as the core under the Party’s absolute, direct leadership and the State’s uniform management and operation. President Ho Chi Minh indicated that our country’s national defence is all-people national defence. It is the national self-defence that reflects the nature of the socialist regime. Its missions include protecting Homeland independence, sovereignty, unification, territorial integrity as well as socialism and fighting against foreign and domestic aggressors. He added that it is necessary to build comprehensive, all-people national defence of which the people must be the subject, and that all people must have responsibility and obligation towards the building of comprehensively strong national defence. The two characters of “all-people” and “comprehensiveness” are closely connected with each other and serve as the basis to create the aggregate strength for the all-people national defence, ensuring stability for the country’s development and maintaining readiness to defeat all invaders and safeguard the Homeland. Ho Chi Minh’s thought on people’s war was built on principles of Marxism-Leninism on armed uprising and revolutionary warfare as well the our nation's tradition of “Entire population fighting the enemy” which was developed to a new height by him. This basic thought was clearly mentioned in the Directive on founding the Vietnam Propaganda Unit of the Liberation Army: “it is necessary to mobilize and arm all people”. The notion “all people” according to his thought was clarified in the Appeal for National Resistance, dated December 19th 1946: “All of you, men and women, young and old, what ever your region, ethnic origin, or political opinion, arise to struggle against French colonialism and save the Homeland. Let those who have guns use their guns, those who have swords use their swords, those have neither guns nor swords use hoes, pick-axes, and sticks. Let all arise to oppose colonialism and defend our Homeland”. Realities show that Ho Chi Minh’s thought on people’s war is always consistent with the Party’s viewpoints and serves as the basis for our Party to set out the guideline for comprehensive, protracted, self-reliant resistance war against the French Colonialists. The connotations of that thought include: resistance war of all people - the whole people take part in the resistance war; comprehensive resistance war - a war in all military, economic, political, diplomatic, enemy agitprop fields; protracted resistance war - prolonged fight, partly and decisive victories; self-reliance. Stressing the importance of self-reliance, he said: “certainly, other countries’ support is good, but we shall not rely on them. A nation that only expects other countries’ support does not deserve independence”. Ho Chi Minh also possesses other important theses underlining the inevitable of building revolutionary strength, people’s armed forces and People’s Army. During the development process of our country’s revolution, in order to meet the objective requirements of the class and national liberation struggle, under the Party’s leadership, our country’s armed forces were step by step organized, built and unceasingly developed. Those were the core ones in support of the whole people to successfully carry out the General Uprising to take power in the August Revolution and then to fight the enemy in the two holy resistance wars against the French Colonialists and the US Imperialists, gloriously fulfilling the cause of national liberation and reunification. One of the most remarkable features of Ho Chi Minh’s thought is the military art of people’s warfare. With clear-headed military thought and strategic vision, our Party and President Ho Chi Minh advocated developing unique, creative people’s warfare. President Ho Chi Minh placed special stress on the method to launch the war as well as the method of operation of the three-category armed forces (permanent force, local force, and militia and guerrilla forces), together with forms of operations of all scales (large-scale, medium-scale and small-scale fight) to annihilate the enemy separately, gain partial victories, then defeat the enemy’s great strength and gain complete victory. The art of combining strength, advantage, opportunity, and strategy represents a fundamental part of Ho Chi Minh’s military thought. He thinks that “strength, advantage, opportunity and strategy” are important factors, and that if they are combined with one another, they could make a huge change at crucial times to the complexion of the battlefield and even the whole war. The art of “summoning strength, gaining advantage, seizing opportunity, employing strategy” serves as a unique feature of our nation’s military art, which has always been exploited and brought into play during wars for national liberation by our Party. In addition, President Ho Chi Minh always advocates the thought of strategic offensive: “resolutely, ceaselessly keeping offensive”; launching attacks to take and hold the initiative, and hold that to attack the enemy; keeping attacking the enemy at any time, any where, with all types of primitive, relatively modern, and modern weapons and equipment. It is a unique, creative feature of the people’s warfare of Vietnam launched by the whole people with the armed forces playing the core role. He explains: as our force is weaker than the enemy’s, we have to attack; the stronger we become, the more attacks we should launch; “our troops and people should always make efforts to attack the enemy”. Our people’s wars for national liberation or to defend the Homeland are fierce confrontations between our country and the enemy in all economic, political, military and diplomatic fronts characterized and directly decided by armed (military) struggle. Under the rule of “survival of the fittest” in a war, to obtain victory, we must be stronger than the enemy in general. Therefore, it is necessary to bring into play the synergy and the strength of national great unity block in combination with the strength of the times. President Ho Chi Minh is not only a great leader of the Vietnamese nation, but a pre-eminent military strategist. His military gift was formed and nurtured during his revolutionary life on the basis of a good grasp of Marxist-Leninist military doctrine, national military tradition and quintessence of human race. Ho Chi Minh’s military and defence thought whose core is on the building of all-people national defence and people’s war is of greatly theoretical and practical value and serves as the priceless treasure of our Party, people and nation. In the face of increasingly higher requirements of the Homeland protection cause, his military and defence thought should be grasped and flexibly applied to the country’s conditions, particularly to the building of Vietnam’s Defence Strategy and Military Strategy in the new period. To this end, it is necessary to focus on the following points. First, correctly perceiving values of Ho Chi Minh’s thought on building all-people national defence and people’s war during the process of building Vietnam’s Defence Strategy and Military Strategy in the new period. Theoretically and practically, Ho Chi Minh’s thought on building all-people national defence and people’s war is of utmost significance to the cause of Homeland protection in general and to the building of Vietnam’s Defence Strategy and Military Strategy in the new period in particularly. Thus, it is imperative that cadres, particularly those from strategic agencies under the Ministry of National Defence, not only fully understand Ho Chi Minh’s military and defence thought as well as his thought on building all-people national defence and people’s war, but grasp all connotations of his revolutionary thought. It should be noted that Ho Chi Minh’s thought on all-people national defence and people’s war has large contents, including basic, comprehensive theoretical issues that relate to the whole Vietnamese revolution. That thought is always consistent with the Party’s viewpoints and serves as the basis for our Party to lay down political, military guidelines in each revolutionary period. In spite of the fact that his theses on all-people’s national defence and people’s war, particularly the issues on building revolutionary force, people’s armed forces, People’s Army, military arts, revolutionary and strategic rear bases, etc., have been mentioned for ages, they remain valid in our troops and people’s cause of Homeland construction and protection today. Notably, that thought covers basic points of Vietnam’s Defence Strategy and Military Strategy in the new period. Therefore, during the process of building the two strategies, it is imperative to firmly grasp the contents of Ho Chi Minh’s thought on all-people national defence and people’s war to ensure that Vietnam’s Defence Strategy and Military Strategy are built in accordance with the guidelines, meeting the requirements of strengthening defence and protecting the Homeland in the new period. Second, firmly grasping basic guidelines of Vietnam’s Defence Strategy and Military Strategy in the new period. Amidst complicated, unpredictable developments of the world situation, many countries around the globe, especially major powers, have built global strategy and national security strategy to take the initiative in the new situation. That demonstrates the necessity and the importance of national strategies to each country’s defence and security. As for our country, the Party and the State have attached great importance to and closely led the building of Vietnam’s Defence Strategy and Military Strategy in the new situation. Political Report at the 10th National Party Congress stated: “Promptly direct the building and promulgation of national strategies, namely the Defence Strategy, the Military Strategy and other specialized ones”. Following that guideline, the Ministry of National Defence has carried out research and surveys, organized scientific workshops, and prepared the 9th Draft Vietnam’s Defence Strategy and Military Strategy in the new period. To accomplish the two strategies, it is necessary to bring into play brainpower of the whole Party, people and military, first and foremost the Central Military Commission and the Ministry of National Defence which is responsible for drafting the documents. Notably, it is essential to perceive the importance and grasp basic guidelines of the strategies. This is a central task of the nation related to every ministry, sector, organization and force, which cannot be performed in a simple, cursory, unscientific manner. First and foremost, it is necessary to be fully aware that Vietnam’s Defence Strategy serves as the strategy to protect the country in each period by tapping the aggregate strength, with defence strength as the particular and military strength as the core. On the basis of closely combining defence with politics, economy, culture, science, technology, diplomacy, the strategy aims to maintain peace, stability and favourable condition for the country’s development, contributing to maintaining peace, stability, cooperation and development in the region and the world. Its leading goal is to prevent, repel and readily defeat all hostile forces’ plots and acts of sabotage: “Resolutely, persistently fighting to defend national independence, sovereignty, unification, territorial integrity, firmly protect national border and sea, island, airspace sovereignty”. Optimal Defence Strategy is the one to protect the country and the regime from afar mainly with non-violent measures, which is organically connected with the National Security Strategy and grounded on a firm grasp of the Party’s standpoint on all-people national defence and people’s security. Vietnam’s Military Strategy along with a number of specialized strategies represents a central part of the Vietnam’s Defence Strategy, including policies, guidelines and measures designed to prevent and readily defeat wars of aggression launched by hostile forces in our country. Vietnam’s Military Strategy focuses on studying the rules and forms of warfare, the types of armed conflicts, the methods to conduct people’s war for national protection, the military arts, the measures to shift the country and the armed forces from peace time to war time, to prepare the battlefield, build up resolution, plans and forms of strategic operation. The Military Strategy directs operational and tactical arts, adjusting strategic issues and resolving strategic missions on the basis of results and principles of operational and tactical arts. Third, applying Ho Chi Minh’s thought on all-people national defence and people’s war to the building of Vietnam’s Defence Strategy and Military Strategy in line with the Party’s political, military and defence guidelines and the conditions of the world and the country in the new period. During the course of Vietnamese revolution, Ho Chi Minh’s thought on revolution, building all-defence national defence and people’s war has been always consistent with the Party’s viewpoint and guideline. His thought served as the important basis for our Party to lay down revolutionary guidelines and strategies as well as detailed contents on building revolutionary force, three-category armed forces, and mobilizing all people to take part in resistance war, clarifying the guideline, directing and leading our people’s cause of national liberation to victory. Applying Ho Chi Minh’s thought on building all-people national defence and people’s war to the building of Vietnam’s Defence Strategy and Military Strategy in the new period must be in line with the Party’s political, military and defence guidelines as well as the situation of the world and the country in scientific, practical and effective manners. Without that approach, the building of the two important strategies will not achieve the goal, meet the requirements or effect the cause of strengthening defence, preventing and repelling risks of war and conflict. The world situation in all phases is characterized by rapid and unpredictable fluctuations and changes which have a huge effect on our country’s revolution in both positive and negative ways. However, in any circumstance, it is necessary to grasp President Ho Chi Minh’s viewpoint “The invariable decides the variable” and firmly hold the goal of national independence and socialism. This is the most important and fundamental similarity between his thought and the Party’s viewpoint and serves as a uniform direction for the Vietnamese revolution in the past, at present time and in the future. Fourth, effectively employing Ho Chi Minh’s thought on building all-people national defence and people’s war to resolve basic issues of Vietnam’s Defence Strategy and Military Strategy, making it relevant to the country’s condition and potential. Vietnam’s Defence Strategy and Military Strategy in the new period include major issues of theoretical and practical value related to various fields, first and foremost the military and defence fields. Therefore, in addition to a firm grasp of Ho Chi Minh’s thought and the Party’s guidelines, it is important to identify basic issues and contents of the strategies on the basis of the country’s condition and potential. It is imperative to avoid identifying the contents of the strategies in a subjective, unscientific, unfeasible manner. There exists in our country a contradiction between the increasingly high requirements set by the task of strengthening defence and protecting the Homeland and the economy’s limited capacity. This is a hard-to-solve “math problem” for us. The two strategies have different spheres and requirements. Vietnam’s Defence Strategy has wider domain, mainly on national defence, being directly connected with the task of protecting the Homeland and the socialist regime; meanwhile, Vietnam’s Military Strategy is mainly on military area and aims at the protection of national sovereignty and territorial integrity. Hence, it is necessary to set the goals of each strategy (general goals and concrete goals) appropriately. As for Vietnam’s Defence Strategy, there should be a focus on studying and correctly assessing strategic scenarios, anticipating opponents and defence situations, and laying down guidelines and principles for defence, methods for defence construction, cooperation and struggle, tasks, measures and mechanisms for leadership and operation. As for Vietnam’s Military Strategy, great importance should be attached to correctly assessing strategic environment, anticipating opponents, studying forms of warfare, people’s war for Homeland protection, strategic operations, organizing battlefield and making preparations for wars and operational coordination at all levels as well as party and political work in peace time, war time and post-war time, and organizing the system of operational leadership, direction and command. Amidst the complicated situation today, due attention should be paid to fighting against and thwarting all hostile forces’ plots and acts of sabotage throughout their “peaceful evolution” Strategy and increased ruses of “self-evolution” and “self-transformation”. This represents a central task of the entire Party, people and military and the goal of Vietnam’s Defence Strategy and Military Strategy, while clearly reflecting Ho Chi Minh’s thought and the Party’s viewpoint on maintaining “peace at home and abroad” and fighting against foreign and domestic aggressors. Fifth, applying Ho Chi Minh’s thought on building all-people national defence and people’s war to the building of Vietnam’s Defence Strategy and Military Strategy must further diversify and develop his revolutionary thought. This is among important requirements set by applying Ho Chi Minh’s thought on building all-people national defence and people’s war to the building of Vietnam’s Defence Strategy and Military Strategy so as to handle the relationship between inheriting, protecting and developing his revolutionary thought. We all know that Ho Chi Minh’s thought is of theoretical and practical value and remains valid all the time. 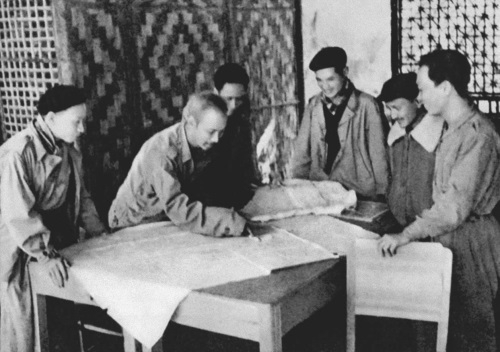 The theses on building all-people national defence and people’s war were carefully studied, summarized and generalized by Ho Chi Minh on the basis of Marxist-Leninist military doctrine, national military tradition, the world’s military quintessence and his experience in realities of Vietnam’s revolutionary struggle, thereby having extremely profound significance and serving as a direction for the Vietnamese revolution. Studying and following President Ho Chi Minh’s thought has become a line for action of our whole Party, people and military. It is not by accident that hostile forces and political opportunists have stepped up distortion of and acts of sabotage against the Party’s ideological background, namely Marxism-Leninism and Ho Chi Minh’s thought. However, no matter how cunning and evil their acts of sabotage, they will certainly fail as Ho Chi Minh’s thought, ethics and lifestyle have reigned in Vietnamese people’s mind. The more severely they deny and sabotage Ho Chi Minh’s thought, the more valuable his thought proves to be. Theory and practice enjoy a dialectical relationship. Theory directs practice, and practice tests and enlightens theory, in turn, making the latter more diverse and complete. Similarly, Ho Chi Minh’s thought on building all-people national defence and people’s war has been tested and proved by realities of our country’s revolution. Applying that thought to the building of Vietnam’s Defence Strategy and Military Strategy in the new period is of necessity and importance. However, more importantly, there should be a close combination of applying, defending and developing Ho Chi Minh’s thought to make it more diverse and durable. That is an action of practical significance, expressing the honour for and a sense of gratitude of the whole Party, people and military for President Ho Chi Minh, the great leader of Vietnamese revolution and nation.